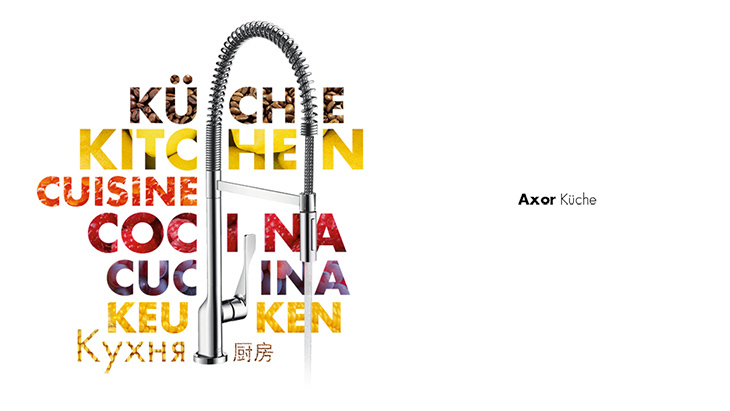 Experience the AXOR kitchen taps on the new AXOR website. Kitchen mixers from AXOR feature ultimate functionality and long-lasting quality, not to mention exceptional ease of use. AXOR kitchen mixers are technologically advanced and beautifully designed for the sink unit. Choose from various high-end functions during the consultation and planning stages: hand sprays with normal and shower spray or variable handle positioning on the right-hand or left-hand side. Swivel ranges of up to 360° or wall-mounted variants with telescopic pull-out offer plenty of freedom of movement, greatly increasing the operating radius at the sink. The AXOR Starck kitchen mixers with high spout feature a joystick handle and an adjustable swivel range. With these, you can position the handle on the right-hand or left-hand side. A model with a low spout is also available. With a 360° swivel spout, the AXOR Starck Semi-Pro variant is ideal for double sinks and island solutions. The elegant, highly functional AXOR Citterio kitchen mixers will enhance any sink unit and they also incorporate impressive practical details. The spout can either be swivelled freely through 360° or fixed at 110 or 150°. The variants that feature a hand spray increase the clearance at the sink unit. The ergonomically shaped handle, which is easy to operate even with dirty or soapy hands, is particularly striking. Both AXOR Citterio M kitchen mixers feature a high spout with individually adjustable swivel ranges of 110, 150 and 360°. The versions featuring a hand spray also offer two different jet types: normal and shower spray. The separate lever handle can be custom-installed in the area around the sink – for example at the back, well away from the reach of children, or on the left-hand rim, ergonomically practical for those who are left-handed. The concealed installation variants of the AXOR Uno2 single lever kitchen mixers feature a practical telescopic spout, which can conveniently be pulled out 330 to 500 mm. Or your customer may opt for one of the two upright models with a 360° swivelling spout. All mixer handles can be positioned on the right-hand or left-hand side.